PattiSue Plumer is a retired American long-distance runner who ran twice in the Olympics. She ran first in 1988 in Seoul, South Korea where she finished 13th in the 3,000m. In 1992 in Barcelona, Spain she ran in the 1,500m, finishing 10th, and the 3,000m, finishing 5th. On July 3, 1989 she set the American record in the 5,000m at 14:59.99, and was the first woman to beat one of Mary Decker’s sweep of all distance running American records during the 1980s. She won the 1990 Fifth Avenue Mile, setting a course record which remains unbeaten. 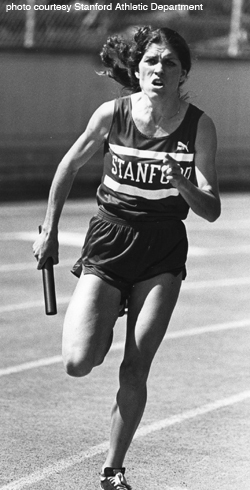 Patti Sue attended Stanford University, where she won the 1984 NCAA Women’s Outdoor Track and Field Championship at 5000m and the NCAA Women’s Indoor Track and Field Championships at two-m,iles in 1983. She won multiple national titles at 3,000m and 5,000m and was a three-time runner-up in the 1,500 meters. She received her Juris Doctor (J.D.) from Stanford Law School and worked as a lawyer for several years. She now coaches cross-country and track at Stanford University in Northern California.